The fallout of Cameron’s decision to use a veto in EU negotiations on a new treaty continued last night as Clegg and the Lib Dems refused to back the PM in a Commons vote. 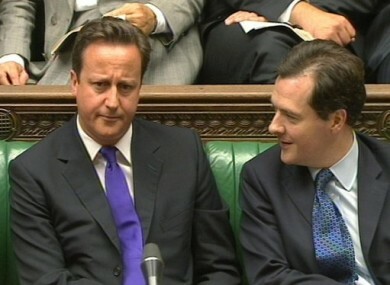 Cameron and Osborne in the House of Commons earlier this year. MINISTER FOR Finance Michael Noonan is due to meet with British Chancellor of the Exchequer George Osborne today as he travels to London for a Bloomberg event. Noonan and Osborne are expected to discuss a number of mutual concerns including the ongoing euro crisis, according to the Examiner. Noonan and Osborne are also expected to discuss economic links between Ireland and Britain amid concern that Britain will become increasingly isolated within the EU by refusing to participate in a new deal on increased EU fiscal consolidation. Meanwhile, Taoiseach Enda Kenny spoke to Prime Minister David Cameron by phone last night to discuss the latter’s decision not to participate in a new EU agreement at last week’s leaders’ summit. The UK was the only one of the EU’s 27 members states who refused to put the issue of a new EU deal to a parliamentary vote. Having come under criticism by his deputy PM Nick Clegg over that refusal, Cameron yesterday defended the move before the House of Comons. He insisted he had participated in the deal’s negotiations “in good faith” but was concerned that not enough safeguards for financial regulation were being included in the deal. Clegg and his Lib Dems party failed to support a later Commons motion backing Cameron’s decision to use the veto. That motion was passed by 278 votes to 200, according to the Press Association. Email “Noonan to meet Osborne amid concerns over Britain's EU isolation ”. Feedback on “Noonan to meet Osborne amid concerns over Britain's EU isolation ”.